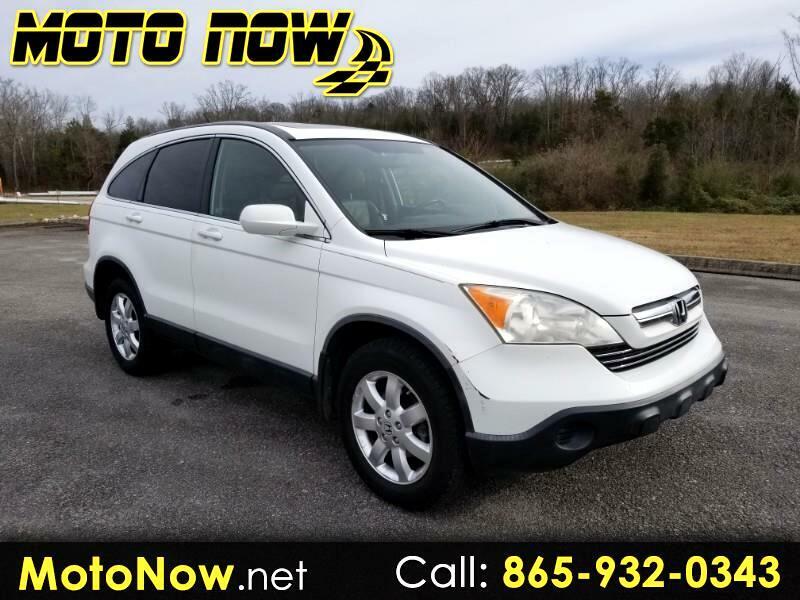 **** AT OUR SEVIERVILLE LOCATION **** The new, 2007 Honda CR-V is more powerful, more stylish and more comfortable than the previous-generation 2006 models. Its new suspension geometry delivers an improved ride and better, more responsive handling. Buyers choose from three models, the LX, the EX and the EX-L. The latter comes trimmed in leather and can be fitted with an optional navigation system that incorporates a rearview video camera for safe and easy backing. All have four doors and seat five. The engine, still an inline four cylinder, employs variable intake valve timing to optimize horsepower and torque for acceleration and cruising speeds. The transmission is a new, five-speed automatic. Real Time all-wheel drive is offered on all three models. The U.S. EPA rates the front-wheel drive CR-V at 23/30 city/highway miles per gallon and the all-wheel drive at 22/28. Inside, compared with the 2006 CR-V, there's slightly more room in the front seat and slightly less room in the rear seat, except hiproom, which is up by about an inch. There's also marginally more cargo room. Everything by way of instruments, controls and storage is, respectively, logically arrayed, properly placed and reasonably plentiful. In terms of safety, the new CR-V is fully featured. In addition to the required three-point seatbelts at all five seating positions and front seat airbags, people protection includes front seat-mounted side airbags, front and rear seat side air curtains with roll-over sensors and front seat active head restraints (which work to reduce whiplash in rear impacts). For crash avoidance, antilock brakes, brake assist, electronic brake-force distribution and Vehicle Stability Assist with traction control are all standard. As for how the '07 CR-V stacks up against the competition, well, in a number of ways, it could do better. Several, especially its arch rival, the Toyota RAV4, offer seating for seven, more powerful and smoother V6 engines and moderately more-capable systems for driving all four wheels. The Mazda CX-7, which seats five, is more fun to drive and to look at. And the Hyundai Tucson and Kia Sportage carry substantially lower sticker prices. Thus, buyers looking for peppy performance, snazzy styling and easier financing have better choices. But for Honda loyalists looking for something better than their current CR-V or an SUV to step up into from their Civic, the '07 is the logical way to go. The Honda CR-V continues for 2007 in one body style, a four-door, five-passenger, crossover-style sport utility. There's one engine, a 166-horsepower inline-4, and one transmission, a five-speed automatic. All come standard with front-wheel drive; four-wheel drive is available for all models ($1200). The LX ($20,600) comes with fabric upholstery, air conditioning, cruise control, powered outside mirrors that fold, power windows, power central locking, driver's-seat height adjustment, 60/40-split rear seatbacks that recline and fold, tilt-and-telescope steering wheel, four-speaker AM/FM/CD/MP3/WMA stereo, trip computer/information center, collapsible tray between front seats, 17-inch steel wheels with P225/65R17 tires. The EX ($22,850) adds a tilt-and-slide power moonroof; intermittent, rear window wiper/washer; steering wheel-mounted audio controls for a six-speaker stereo with an in-dash, six-CD changer; dual-deck cargo shelf; lights-and-horn security system; rear privacy glass; and outside ambient temperature gauge. The EX-L ($24,800) features leather-trimmed seats; heated front seats mirrors, armrests and steering wheel; XM satellite radio with a 90-day trial subscription, front center console (replaces the collapsible tray). GPS-based navigation system with voice recognition and rearview camera ($2000) is optional on the EX-L.
Honda-approved accessories available from dealers (installation price set by dealers) include wheel locks ($54); attachments/racks for bicycle ($128), kayak ($160), skis ($139) and surfboard ($75); roof box ($299); auto-dim inside mirror with compass ($225); amplified bass speaker system ($315); and backup sensors ($259). Safety features that come standard include the required three-point seatbelts at all five seating positions, front airbags and child safety seat anchors (LATCH), front seat-mounted side airbags (to minimize upper body injuries in side impacts); roof-mounted, front and rear seat side air curtains (to minimize head injuries in side impacts and rollovers); and front-seat active head restraints (to minimize neck injuries in rear impacts). For crash avoidance there are antilock brakes (which let the driver steer during panic stops); electronic brake-force distribution (which optimize brake application during emergency stops); brake assist (which senses impending emergency brake application and boosts pedal pressure); Vehicle Stability Assist (Honda's electronic stability control system that attempts to minimize skidding in turns); and tire pressure monitors (which warn of dangerous drops in tire pressure).